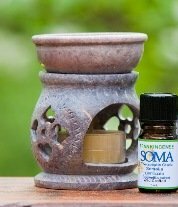 This is such a beautiful, high quality soapstone diffuser. Natural stone with carved designs and a removable bowl to hold your essential oils. Because soapstone is a natural product, the color may vary slightly. Stands 3.25 inches in height.